The Nexus 7 isÂ definitelyÂ 'hot' when it comes to Android Tablets of the now, and as with all good devices there are endless amounts of accessories you can purchase toÂ complimentÂ them. Â One thing I always strive to own is 'the perfect case', a quest that often goes unfulfilled, but maybe not for this device! I have got my hands on this niceÂ pieceÂ of kit available for Â£17.95 from Mobile FunÂ and comes in a choice of colours (Black, White, Red and Purple) as you can see, mine is red. Now I cannot say for certain if this is real leather or not (probably not) but it certainly feels like it is real (along with that new leather smell) the case feels a good quality, fairly thick (but not too thick). 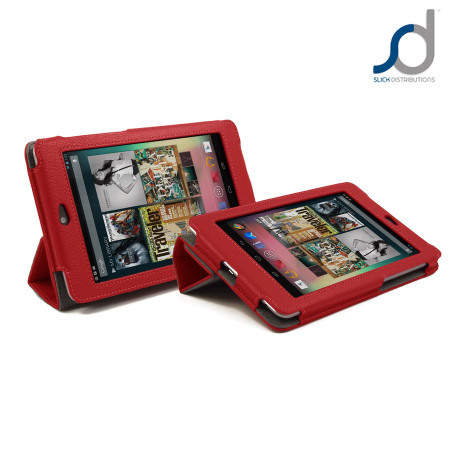 Â It has a soft inside layer that will protect your screen andÂ overallÂ device. with cut outs for the speaker, USB ports, hard keys and camera. One of my biggest concerns before IÂ receivedÂ this case was that it would make the Nexus feel too bulky (as with most cases) and it does a little but is nowhere near as bad as I was expecting and has not prevented me keeping the device in the case on a day-to-day basis. The case is very nice to use, the flap feels sturdy and is easy to open and close (with a magnet to stop it flapping open if you hold the device upside down. The flap also folds backÂ completelyÂ under the device so you can still hold it easily. One downside, which is more a fault with the tablet than the case, is that theÂ hard-keysÂ are a little difficult to press (due to their slight angling), but I believe this will be a downside to any case. Thanks to MobileFun for the video - I would usually do my own but I don't think I could better this one. This case comes with two pretty good features that sets it aside from most other cases I have seen. 'Sleep Mode' - you may have seen this on devices like the iPad or blackberry smartphones. Â Basically the Nexus 7 has a magnet inside (although not actually advertised as a feature) that when another magnet is nearby the screen will turn off. Â This particular case also has a magnet in the 'flap' which means when you close the cover the device sleeps, when you open it the device wakes! No more need to keep hammering that power key to wake the tablet up, or worrying that the screen is on when you're not using it. Foldable Stand - You will see from the images above and below that this case can also fold into a stand (the same fold is actually two different types of stand). Â This stand can be used for aÂ convenientÂ desk or 'viewing' position, or turn the device around and it lies flatter on the desk for a comfortable typing position. This brings me to my next downside of this case, due to the way it folds into a stand you are left with two crease lines down the front cover of the case, this probably wouldn't bother most people but if you like everything to stay perfect forever then maybe this is a point to consider. Learning how it folds is relatively simple but you may need to have a look at the pictures on MobileFun.co.uk or here to confirm how it should look. The only downside that sticks to my mind is the creases that the folds on the cover create (due to the way it turns into a stand). You could do a lot worse than buy this case.